The Ottawa Art Gallery’s Senior Curator, Catherine Sinclair, will describe the long process of achieving the new building, where the OAG sits in Ottawa’s cultural landscape, and introduce the contents of the inaugural exhibition Àdisòkàmagan / Nous connaître un peu nous-mêmes / We’ll all become stories: A Survey of Art in the Ottawa-Gatineau Region, soon to open in April 2018. Catherine Sinclair is Senior Curator at the Ottawa Art Gallery (OAG). She holds an MA in Canadian Art History from Carleton University (2006). With more than ten years at the OAG, she has curated upwards of forty exhibitions, including the successful Canadian Heritage-funded, provincially-touring exhibition, Alma: The Life and Art of Alma Duncan (1917-2004) (2014-16), and has worked extensively to animate the Firestone Collection of Canadian Art through a variety of strategies, including contemporary interventions. She has presented her work at national forums including the University Art Association Conference (UAAC) and the Canadian Women Artists History Initiative Conference (CWAHI). This free presentation will include a slide show and talk about the new Ottawa Art Gallery and its exciting spaces and displays. The presentation will be in English with questions answered in French or English. Gustave Sennelier opened the doors of the Maison Sennelier at 3 Quai Voltaire in 1887. This Parisian landmark faces the Louvre on the Left Bank, just around the corner from the École des Beaux Arts. Artists like Cézanne, Gauguin, Monet, Bonnard, Soutine, Picasso, Modigliani, Kandinsky, and Dali made this place a historic rendez-vous. Sennelier has been a resource for artists since the era of the Impressionists, and that tradition continues today for all customers of the Maison Sennelier. Address: 199 Glenpark Dr. Ottawa K1B 5B8. 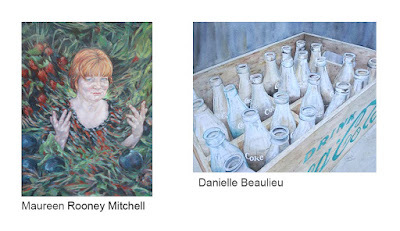 The Blackburn Library in conjunction with Arteast is proud to present an exhibition of paintings in oils by Maureen Rooney Mitchell and watercolours by Danielle Beaulieu. Both artists are well known for their insightful , well executed paintings . Maureen’s works in oils are figurative, using people she knows in sometimes surreal settings. Danielle specializes in watercolor , using a variety of detailed subjects beautifully realized and interpreted. The maximum number of participants is 12. Fees are payable by e-transfer to kpeters@domingoinformatics.ca. Please contact her at kpeters@domingoinformatics.ca for further information. This is open to all paid up Arteast members. Titles of works, media, size and price indicating framed or unframed. You can choose if you wish to sell the work or not. Also send your current artist’s statement or bio. You can link your website and or contact information by including it in your statement/bio. Send these via email titled for Members Gallery to president@arteastottawa.com The images are checked for quality and suitability for a family friendly website. Your information should be complete and up to date. Hope to see you soon in the Members Gallery. Avez-vous joint le siteweb de la Galerie des membres d’Arteast ? C’est offert à tous les membres réguliers d’Arteast et facile à faire. Préparez 5 belles images jpeg (format 640 X 800) dpi 100 de vos œuvres. Indiquez : titre, médium, format, prix, encadrement, sans encadrement. Vous avez le choix de vendre ou non l’œuvre. Et, inclure votre biographie récente tout en notant dans votre bio le lien avec votre siteweb. Les images seront vérifiées pour leur qualité et leur convenance dans un site amical. Votre information doit être complète et à jour. Espérant vous voir à la Galerie des membres. La Galerie Old Chelsea est un collectif d'artistes régionaux qui exposent leurs œuvres à la Galerie. Celle-ci est située au-dessus du restaurant Les Fougères à Chelsea, Québec. La Galerie offre un espace d'exposition de 40 pieds linéaires à des artistes invités. La Galerie accepte actuellement des propositions d'exposition pour sa programmation de 2019. Plusieurs artistes seront sélectionnés et chacun sera alloué trois semaines pour une exposition. Les artistes résidant à l’intérieur d’un radius de 100 kilomètres d’Ottawa-Gatineau, à tous les stades de leur carrière professionnelle, sont encouragés à postuler. 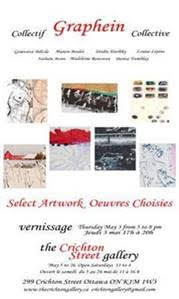 Les artistes choisis auront à choisir une de deux modes de contribution : soit une commission de 25% sur les ventes de leur exposition à la galerie ainsi qu’un frais d’exposition de 290 $; ou une commission de 35% sur les ventes de leur exposition à la galerie ainsi qu’un frais d’exposition de 200 $. 4. Une liste d'images numérotées avec des informations détaillées sur chaque oeuvre correspondante (exemple : 01_ Titre_Medium_Dimensions_année de création_prix. Les soumissions seront examinées par un jury d’artistes professionnels et les candidats retenus seront notifiés de la décision du jury par courriel. Galerie Old Chelsea is a collective of regional artists who exhibit their own works at the gallery. The gallery, located above the restaurant Les Fougères in Chelsea, Québec, offers an exhibition space of 40 linear feet for guest artists. The gallery is currently accepting exhibition proposals for 2019. Several artists will be selected and each will be assigned a three-week exhibition period. Artists currently living within 100 kilometers of Ottawa – Gatineau, at all stages of their professional careers, are encouraged to apply. Selected artists have a choice of two modes of contribution: a 25% commission on all sales occurring during their show plus a show fee of $290; or a 35% commission on all sales occurring during their show plus a show fee of $200. 4. A numbered image list with detailed information about each corresponding artwork (Example: 01_ Title_Medium_Dimensions_year of creation_price. Submissions will be reviewed by a jury of professional artists and successful applicants will be notified of the jury’s decision by email. The Ottawa Valley chapter of Canadian Parks and Wilderness Society is hosting its second annual DRAW Retreat on the Dumoine River. Would you like to participate in an artist retreat on the magnificent Dumoine River this August? The DRAW retreat will bring together artists working in different mediums and from communities across Eastern Ontario and Western Quebec. We will explore the Dumoine River, create works of art, share stories and become inspired by this magnificent landscape. In hosting the DRAW retreat, we hope to introduce local artists to this beautiful piece of Canadian wilderness. The Dumoine River is the last un-dammed Quebec tributary of the Ottawa River and one of only a few rivers in central Canada free of dams. The DRAW retreat is free for all participating artists, in exchange, all artists will donate one completed piece to CPAWS-OV to help support the campaigns that protect the Dumoine River and wilderness across Eastern Ontario and Western Quebec. To learn more, please visit our website or contact Jesse at jlever@cpaws.org. For inquiries or assistance, please email publicartprogram@ottawa.ca or call 613-244-4434. Applications must be received by Monday April 23rd, 2018 or be postmarked on or before this date. 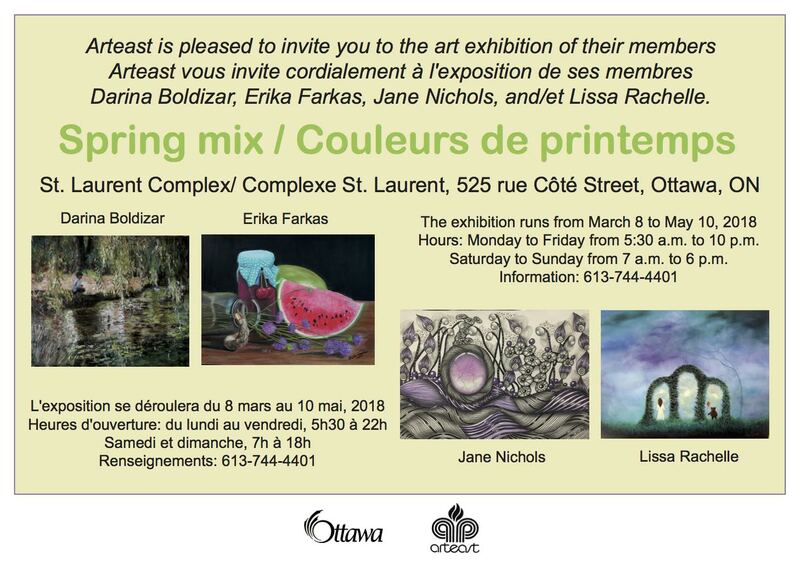 The City of Ottawa invites professional artists and their representatives to offer existing artworks for purchase. Applications are reviewed by a peer assessment committee and selected artworks will become part of the City of Ottawa Art Collection. The City of Ottawa’s Public Art Program invites artists to submit qualifications for an Artist in Residence opportunity to design, fabricate and install a permanent artwork for Elgin Street as outlined in the Call to Artists. This three-stage competition is held in accordance with the Public Art Policy. City Council approved the Functional Design for Elgin Street (Gloucester Street to Queen Elizabeth Driveway) and Waverley Street (Elgin Street to Jack Purcell Lane). The watermains and deep sewers under these streets are among the oldest in the city, dating back to the late 1800s. The need to replace this aging infrastructure created a unique opportunity to assess the road surfaces and redesign them to meet the City of Ottawa’s Traditional Mainstreet designation in the Official Plan, Complete Streets policy and Accessibility Design Standards. https://nepeanfineartsleague.com/membership/membership-application-and-renewal. I am attaching the necessary registration documents. The annual Ottawa Orchid show at the RA centre will be held this year on Saturday and Sunday April 21 and 22 which will be larger than usual this year with more exhibits of blooming orchids as well as more vendors offering orchid plants for sale There will be a special art exhibit of orchid art, watercolour, oils, lacework, jewellery and more, as well as a photography exhibit. A period for camera enthusiasts has been reserved from 9-11 on the Sunday 22nd. Tripods may be used at the Sunday session but we ask that they not be used the remainder of the show times. We would be grateful if you would inform your members of this event. I have attached a poster with details of admission etc and an entry coupon which will give a discount off the regular admission price for use by your members. Both poster and coupon can be copied into your newsletters. May 1, 2018. The changeover at the Orleans Library is between 10:30 a.m. and 11:30 a.m. The next change-over will be on Tuesday, MAY 8, 2018. 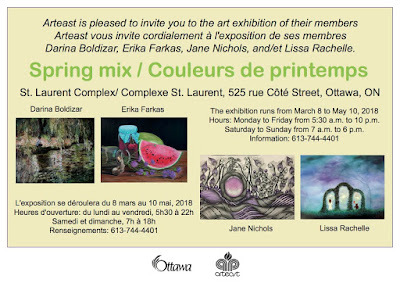 If you are interested in exhibiting, an advance email, on or before Wednesday, MARCH 7, 2018 to Christine Gendron, christinegendron@sympatico.ca, indicating the number of works and their sizes, would be helpful. Or, just show up at the date, but risk being turned away. We look forward to seeing exhibitors on Tuesday, MARCH 13, 2018. Please contact kpeters@domingoinformatics.ca for further information. We are working to bring together Cumberland artists and artisans to showcase your talents in local events and studio tours. A listing of local artists may become a great way to network with other local artists. Please send details: type of artwork, contact information, website and preferred participant activities to Susan Ashbrook at ashbrookcreative@gmail.com. Nous travaillons à rassembler des artistes et des artisans de Cumberland pour mettre en valeur vos talents dans des évenéments locaux et des tournées de studio. Une liste d'artistes locaux pourrait devenir un excellent moyen de réseauter avec d'autre artistes locaux. Veuillez ebvoyer vos informations, telles que votre type d'art, vos coordonnees, votre site Web et les activités auxquelles vous aimeriez participer à Susan Ashbrook à ashbrookcreative@gmail.com.